PraiseVille, a new parish brand of the Celestial Church of Christ, founded in Berlin, Germany and now replicated in Lagos, Nigeria is blazing a new trail in the 71-year old parent Church. 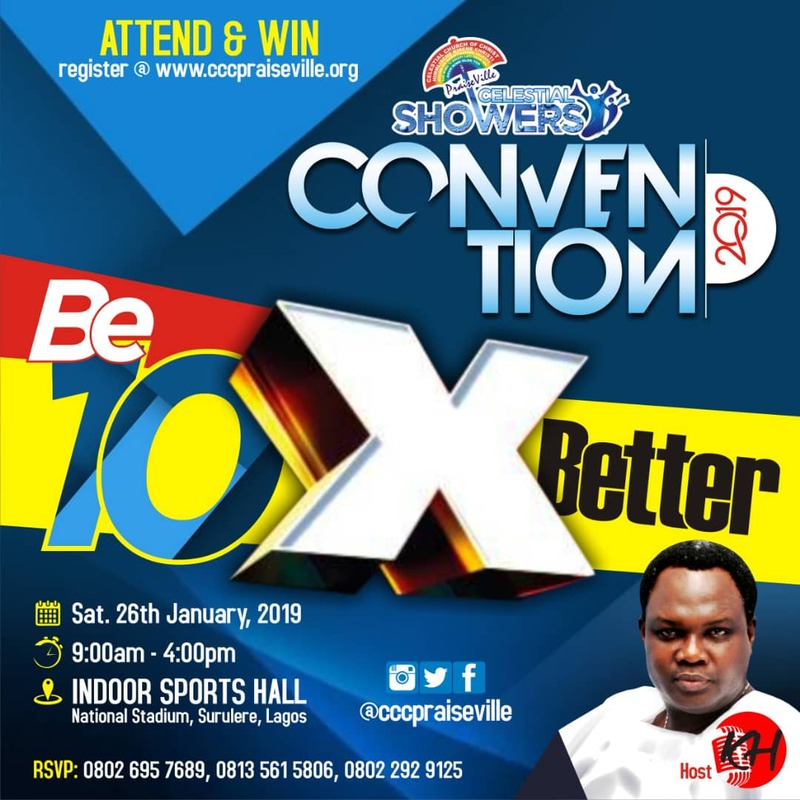 On Saturday January 26, 2019 at the Indoor Sports Hall, National Stadium, Surulere, Lagos, CCC PraiseVille will host 3,000 young Celestial professionals and intellectuals to the Celestial Showers Convention 2019. Addressing major social media influencers and bloggers at PraiseVilles Lagos auditorium on December 15, PraiseVille Shepherd and Convener of the 2019 Convention, Dr. Kunle Hamilton, explained that it will be a first-of-its-kind Convention and a radical way of preparing thousands of Christians for exploits throughout the New Year. Tagged 10 Times Better the Celestial Showers Convention shall feature some of the best speakers and singers Africa has to offer. Our key speakers are myself; Mr. Andrew Gbodume, Managing Director, MRS Oil Nigeria; Ambassador Henry Olufumi Macauley, former Sierra Leone Minister for Energy; Oluwatoyosi Ogunseye, Head of Language Services, British Broadcasting Corporation; Tina Mba, celebrity actress stage and screen; and Femi Faseun, Professor of Music, Lagos State University. “The speakers will be developing the total being in each of our 3000 participants, while covering knowledge and experience areas of business, professionalism, music, drama, personal excellence, nation building and governance. There will be musical interludes to bridge the secular and spiritual sessions and these will feature some of the best Celestial choirs. “Highlights of the Convention include free breakfast for everybody from 8.00-9.00am, surprise value gifts for those who register online as well as the lucky ones among the 3000 participants. “There is a professional giveaway for everyone who submits their typed CVs at the venue. Professional HR Assessors will evaluate their employability and once found eligible, they will be recommended for job interviews for some of Nigerias most lucrative job vacancies. We are inviting all Celestians who are Nollywood and music celebrities and some of them have been selected for special interactive sessions where participants can take selfies with the stars as well as ask them trending questions. 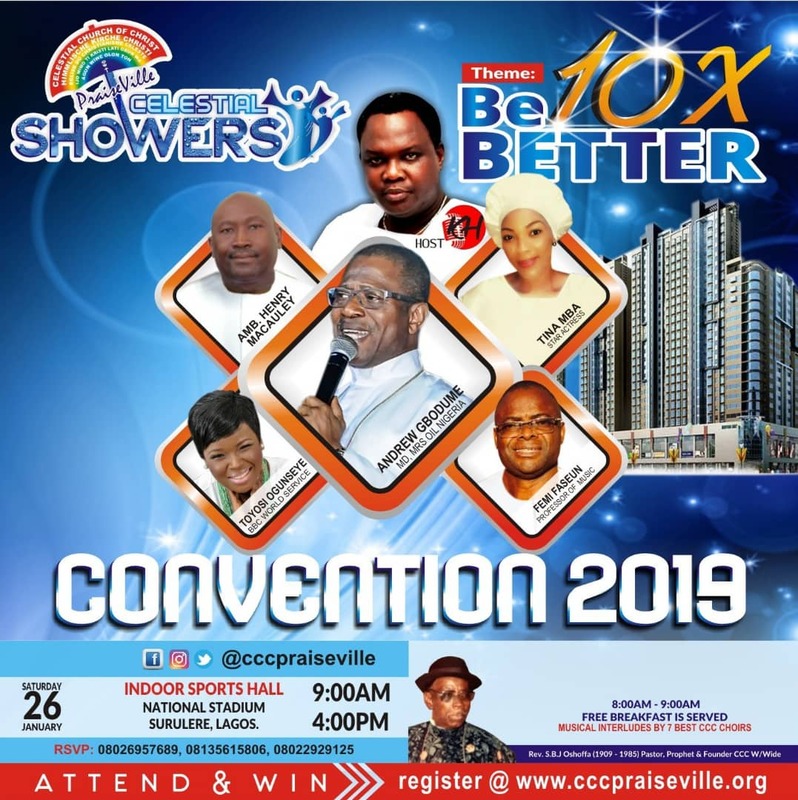 The Celestial Showers Convention is powered by PraiseVille and led by its Shepherd, Dr. Kunle Hamilton, a Prophet and Most Superior Evangelist of the Celestial Church of Christ. OLUWATOYOSI OGUNSEYE is the Head of Language Services – West Africa) at the BBC World Service. She was Nigerias youngest and first female Title Editor at Punch Newspapers. Shes a Mandela Washington Fellow, two-time CNN African Journalist of the Year and Nigerias most decorated journalist with over 35 professional awards. She is currently a PhD student of the University of Leicester, United Kingdom. OLUWATOYOSI will be speaking on Nationhood & Personal Excellence at the Celestial Showers Convention 2019. ANDREW GBODUME is the Managing Director of M.R.S. Oil Nigeria Plc formerly known as Texaco Nigeria. He is a well respected Evangelist of the Celestial Church of Christ, a lover of the gospel and of good works. He was the Executive Director of Finance & Administration before his appointment as MD. He is a Member of the Institute of Directors; Nigerian Institute of Management; and the Chartered Institute of Taxation of Nigeria. ANDREW GBODUME will be speaking on Business & Professionalism at the Celestial Showers Convention 2019. FEMI FASEUN is a Musicologist and Professor of Music and Creative Arts at the Lagos State University, LASU. He championed the first Students Fellowship of the Celestial Church of Christ at the University of Nigeria, Nsukka where he was the Best Graduating Student of Pianoforte. He is an expert in Music Curriculum Planning, Criticism, Dance, Writing and Editing. PROFESSOR FASEUN will be teaching the Best Music Lessons to CCCs best Choirs, Singers, Composers and Instrumentalists who attend the Celestial Showers Convention 2019. AMBASSADOR HENRY MACAULEY was born in Freetown, Sierra Leone. He was Sierra Leone High Commissioner to Nigeria and has just completed an excellent assignment as the Minister of Energy for the Government of Sierra Leone. He has also worked in France and the United States. He established Unipetrol in Sierra Leone and Petrotex in The Gambia. He is the CEO, Energy Afric. He speaks Creole, English, French, Spanish and Portuguese fluently. AMBASSADOR MACAULEY will be speaking on Governance & Global Perspectives at the Celestial Showers Convention 2019. TINA MBA is a frontline Nigerian stage and screen actress. She was nominated for Best Supporting Actress in the 7th Africa Movie Academy Awards. She is a Prophetess and Mother in Celestial Church of Christ. She is from Enugu State. In 2017 alone, Tina Mba starred in Isoken, Bariga Sugar, Okafor’s Law among others, and was described as Actress of the Year by Pulse, while Africa Magic also nominated her Best Actress in a Comedy. TINA MBA will be speaking on Drama and Evangelism at the Celestial Showers Convention 2019. Hamilton is a Media Specialist. He consults for 3 African Presidents, 3 multinationals, 2 universities, 7 churches, an Embassy and 3 technocrats. He is the Convener and Chief Host of the Celestial Showers Convention 2019. He is a Most Superior Evangelist, Prophet and Patron of many Celestial Student Parishes. He is the Shepherd of CCC PraiseVille in Germany and Nigeria; President, ShaddaiVille Ministries in the United Kingdom, United States, Germany and Nigeria. He is a father and husband of one wife. DR. HAMILTON will be speaking on How to Become 10 Times Better at the Celestial Showers Convention 2019.